The South Stream project has been abandoned. Vladimir Putin made a statement to this effect during his recent state visit to Ankara, a visit in which he agreed to increase supplies to Turkey and, possibly, via the country to the European market. No one would call this a sensation. The EU Commission is actively blocking Russia's initiative. The EU constantly speaks about the political threats of importing gas from Russia and officially announces its aim of reducing dependence on it. Russia's economic situation is far from rosy: There are no extra resources for investments and priorities must be set. The price of hydrocarbons is falling. In these conditions, to continue with the project, whose profitability raised doubts even in better economic times, would be an odd obsession. South Stream is a legacy of the late 2000s and early 2010s. Back then, Russia hoped that the close partnership with the EU could be taken to a new level, bypassing (literally and figuratively) politically sensitive "intermediate" countries - first and foremost Ukraine. At the beginning of the last decade, Russia had a different objective: To make Ukraine an integral part of the EU gas supply system, that is, to restore, on a fresh basis, a single thread linking Russia and Europe, just as it functioned during the USSR. In 2002-2003 Moscow, Kiev and Berlin discussed a tripartite gas consortium, but there was no progress, mainly because of Kiev's position. Then Kiev entered the Maidan period and constructive negotiations came to an end. The result was the beginning of the history of the "streams": the North Stream along the bottom of the Baltic Sea to Germany and the South Stream across the Black Sea and south-eastern Europe to Austria and Italy. Moscow believed that the EU was interested in an uninterrupted gas supply and therefore would only welcome the diversification of routes. However, political relations began to fall apart and the subject of energy became an issue not of economy but of security. 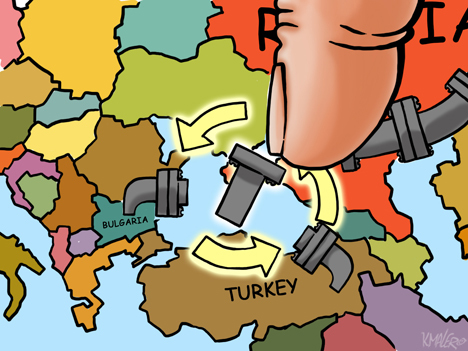 North Stream was made possible thanks to Germany's tough stance. The country wanted to be insured in case there were problems with Ukrainian transit. Berlin had the resources in the EU to overcome the discontent voiced by the Baltic states, Poland and Scandinavia, especially since there were no land transit countries between Russia and Germany in the "stream." The main lobbyist for South Stream was Austria, but it did not have enough administrative resources, even more so now since the political situation has drastically deteriorated due to another Ukrainian crisis. But most importantly, the events of 2014 forced Russia to review its priorities. We saw the "strategic partnership" with the EU begin to break down due to differing views on the "intermediate" countries. The burst of mutual hostility, including the sanctions, also undermined economic cooperation, which had seemed uncontested. The basis for supplying oil and gas to Europe was established by agreements in the 1960s, then greatly expanded in the 70s and 80s. This predetermined the vector of geopolitical relations for a long time. The “eastern policy,” or Ostpolitik (the qualitative improvement of relations between West Germany and the USSR and the socialist countries), which was begun at the end of the 60s by Chancellor Willy Brandt, depended substantially on this factor. The economy of West Germany (and subsequently of unified Germany) needed solid positions in eastern markets. Germany and Italy, the recipients of the "streams," were at the origins of the close oil and gas interdependency between the USSR/Russia and Europe. Almost half a century later, an attempt was made to repeat that model in a new historical phase, but it did not work. Forty years ago (the era of the Arab-Israeli wars), Siberian crude was a way for Europe to reduce its dependence on politically dubious suppliers in the Middle East. Now the Old World considers importing from Russia to be dangerous. Whether this is fair or not is a separate issue. But it is obvious that the events in Ukraine have played an extremely negative role. Germany, in turn, is reviewing its “eastern policy.” There are several reasons for this, from the gradual change in its energy balance in favor of more diversification to its new political self-awareness as Europe's sole leader. The result, however, is that relations between Russia and Germany, like those between Russia and the EU, are quickly cooling. As a result, a new Ostpolitik is being formed. But on this occasion the initiative stems from Moscow and is directed to the east and southeast of Russia: a series of gas agreements with China, the adoption of a more active position toward Asia, the gamble on Turkey as a consumer and transit country for Russian crude, the energy deal with Iran and so on. The change in course is capable of predetermining geopolitical preferences for a period no less enduring than that which resulted from the decisions of the 60s and 70s. Certainly this policy will not be smooth. Dealing with the new partners will be no easier than it was dealing with the old ones. There will be large and sometimes risky investments. Russia is clearly not breaking with Europe: The contracts that have already been signed will last for decades to come. However, the pivot eastward to Asia and the transference of Russia's attention to that region are more than explainable, and inevitable - particularly since the West is pushing Russia in that direction. The author is Chairman of the Presidium of the Council on Foreign and Defense Policy.